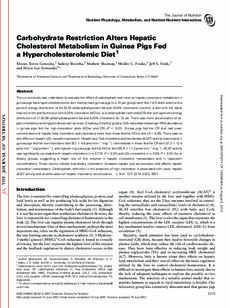 The current study was undertaken to evaluate the effect of carbohydrate restriction on hepatic cholesterol metabolism in guinea pigs fed a hypercholesterolemic diet. Hartley male guinea pigs (n = 10 per group) were fed 1 of 3 diets: a diet with a percent energy distribution of 42:23:35 carbohydrate:protein:fat and 0.04% cholesterol (control), a diet with the same macronutrient distribution but with 0.25% cholesterol (HChol), or a carbohydrate-restricted (CR) diet with a percent energy distribution of 11:30:59 carbohydrate:protein:fat and 0.25% cholesterol for 12 wk. There was more accumulation of hepatic cholesterol and triglycerides as well as lower 3-hydroxy-3-methyl glutaryl-CoA reductase messenger RNA abundance in guinea pigs fed the high-cholesterol diets (HChol and CR) (P < 0.01). Guinea pigs fed the CR diet had lower concentrations of hepatic total cholesterol and cholesteryl ester than those fed the HChol diet (P < 0.05). There was no diet effect on hepatic LDL receptor expression. Hepatic acyl CoA cholesteryl acyltransferase (ACAT) activity was lowest in guinea pigs fed the low-cholesterol diet (9.7 +/- 4.8 pmol.min-1.mg-1), intermediate in those fed the CR diet (37.3 +/- 12.4 pmol.min-1.mg protein-1), and highest in guinea pigs fed the HChol diet (55.9 +/- 11.2 pmol.min-1.mg-1). ACAT activity was significantly correlated with hepatic cholesterol (r = 0.715; P < 0.01) and LDL cholesterol (r = 0.59; P < 0.01) for all dietary groups, suggesting a major role of this enzyme in hepatic cholesterol homeostasis and in lipoprotein concentrations. These results indicate that dietary cholesterol increases hepatic lipid accumulation and affects hepatic cholesterol homeostasis. Carbohydrate restriction in the presence of high cholesterol is associated with lower hepatic ACAT activity and an attenuation of hepatic cholesterol accumulation.